Golfer's elbow is most common in men between 20 - 49 years of age, however it can affect anyone who uses their hands, wrists and fingers to wrap around instruments, type on keyboards, or grip objects (golfers, pitchers, racquet players, small parts manufacturers, office workers, lab technicians, hygienists, carpenters, wood choppers). 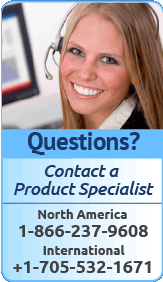 It is most often a result of forceful contractions and overuse. Tennis elbow and golfer's elbow are a result of vigorous use and movements or overstraining of the forearm muscles that move your fingers, hand, wrist and forearm. Overuse of your muscles really depends on how long you do something and how much effort you exert doing it. The constant tugging at the point of attachment on the outside of your elbow (lateral epicondyle) or the inside of your elbow (medial epicondyle) can cause these tendons to become inflamed and strained. Your muscles and tendons can then become irritated which can result in weaker tendons, tiny tendon tears and development of scar tissue and/or calcium deposits. The development of scar tissue will put pressure on your soft tissue and nerves, and interrupt the blood flow to this area; this can be very painful (see ultrasound therapy for scar tissue treatment). If golfer's elbow pain is due to a deterioration of the tendon (tendinopathy), it can take from two to six months to fully recover. Many cases of medial epicondylitis become chronic problems (just like lateral epicondylitis) that progressively get worse if the sufferer continues performing the causal activity that started the condition in the first place. When you do this, your body definitely indicates there is a problem as the area will continue to generate a lot of pain. 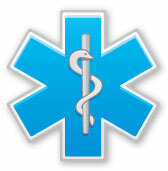 Acute Trauma: this can occur from an accident or high intensity movement. An example of this would be straightening your arm while hitting a golf iron into the ground. Repetitive Stress Injury (RSI): this happens through overuse of the elbow joint without proper treatment or recovery. An example of this would be spending hours per day typing at a computer without taking a break. Re-Injury (Chronic Trauma): this injury is from continually injuring your medial epicondyle tendon. Small tears in the tendon form and worsen over time, allowing the growth of scar tissue. An example of this would be painting high walls or ceilings with an already damaged elbow day in and day out. Over time with overuse, your muscles and tendons can become irritated which will result in weaker tendons, tiny tendon tears and development of scar tissue and/or calcium deposits. The development of scar tissue will put pressure on your soft tissue and nerves, and interrupt the blood flow to this area. Scar tissue is tough to get rid of and can cause significant pain over a long period of time. Fortunately, Deep Tissue Regeneration Therapy treatments aid in the reduction of scar tissue and when combined with physical therapy and a conservative treatment plan, most patients can rid themselves of epicondylitis and get back to a normal pain free lifestyle faster than would ever expect. Technique of Movement and Tools Used (ie. proper versus improper form on the court, use of an ergonomic keyboard when typing may help prevent tendonitis, etc. General Health and Wellness (armchair & weekend athletes are at greater risk of a tendon injury compared to an athlete that does such activities on a daily basis. As you can see, its not just professional athletes or people with physically demanding jobs who suffer from Golfer's Elbow. Actively moving your arm for long periods of time can cause a lot of stress to be exerted on your elbow. Repeated movements gradually increases the stress placed on muscles.If you don't give your body a chance to rest and regain strength, stronger muscles ( like the ones in your shoulder )have no choice but to transfer energy to less capable structures (such as the muscles in your hand or wrist ). Weaker muscles cannot handle the impact stronger muscles can. As a result, they begin to strain and even tear. It is important that you allow your body to rest between periods of exertion or repetitive movement. Fatigue in your muscles can lead to bad form, or overuse. You body is an amazing thing! It is constantly trying to heal itself and perform at its fullest capabilities. When you don't allow your body to rest and push yourself beyond your physical limitations, chances of becoming injured are quite high. So What Happens To Your Tendon If It Is Forced To Deal With Overuse And Repetitive Movement? Your tendons attach your forearm muscles to the bone of your elbow. When high levels of stress are exerted on your forearm, tendon fibres stretch beyond their limits. If this action is repeated over and over again, tendon fibers lose their strength and elasticity. They can become disorganized and tangled. If repeated long enough or with too much stress exerted, your tendon fibres may even begin to tear. These small tears cause inflammation in the area of your elbow called the epicondyle ( the bony bumps just below your elbow where the tendon attaches the forearm muscles to your elbow bone ). You elbow may become swollen, bruised, or disfigured. Your elbow joint is a very small complex structure and doesn't handle swelling well. Swelling will limit blood flow. Micro tears and swelling can cause mild discomfort to intense pain. The limited blood flow can restrict your body's ability to heal. If not treated, your tendon will begin to deteriorate. It can take months for you to fully recover. If you repeatedly injure your tendon without proper treatment and recovery, scar tissue will form. Scar tissue is weak and inflexible tissue that hardens around the tendon without giving it any support or strength. Scar tissue will never heal into healthy, mature, strong tissue. Scar tissue will put pressure on your soft tissues and nerves. It interrupts the blood flow to the areas of your elbow causing pain and delaying recovery. It is important to prevent the growth of scar tissue with conservative treatments. 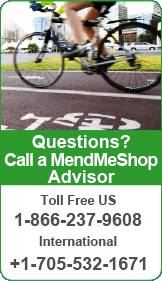 This is why it is very important to seek medical advice when you've had an accident or injury. Your doctor will be able to recommend the best course of action for treating your injury using cooling and heating therapies. Incorporating Deep Tissue Regeneration Therapy (via use of an Elbow T•Shellz Wrap®) will increase your body's ability to heal faster (and thereby reduce growth of scar tissue) by promoting significantly higher flow of blood to your elbow or forearm injury. Age is always a factor when it comes to injury. As we become older, our tendons begin to weaken and eventually break down. By not training our bodies or allowing repetitive injuries, we speed up this process. Degeneration, or the break down of tissues, is especially noticeable in individuals who have a repeated history of overuse. 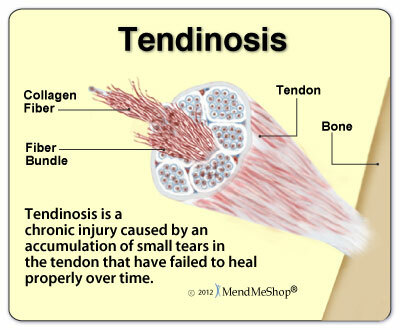 Over time, repeated damage to your tendon can cause you to develop a condition called 'Tendinosis'. This means that your tendon becomes unable to ever heal fully. Age and repeated injury without proper treatment can cause the breakdown of your tendon. Your body is an amazing organism and has all of the tools to heal itself. However, healing your tendon can take a very long time. It is unrealistic to expect anyone to put their life on hold for weeks or months. Without the proper treatments, your tendons will thicken with weak, inflexible scar tissue. If you are experiencing a deterioration of the tendon (tendinopathy), it can take from two to six months to fully recover. Many cases of medial epicondylitis become chronic problems that progressively get worse if sufferer continues performing the causal activity that started the condition in the first place. When you do this, your body definitely indicates there is a problem as the area will continue to generate a lot of pain. Only you can prevent injury. Take steps before you injure your body to avoid spending valuable time in recovery instead of at work, with your family, or your favorite activities. 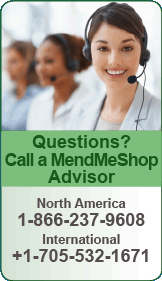 It is important that you speak to your doctor about the recovery and prevention options available to you. The more committed you are to your recovery, the faster you can return to your active lifestyle free from pain and immobility. Have you recently re-injured your elbow by returning to your normal daily activities too quickly? How many times in the past have you aggravated your elbow just trying to perform basic tasks around your house? Is your golfer's elbow preventing you from work or activities you love to do? Most people we deal with tell us these scenarios have happened to them many times in the past. The real challenge is how to promote blood flow to your injured elbow without causing further damage. This goal is even more complicated by the fact that you have to use your arm / elbow for almost everything in everyday life. What Can You Do To Actually Start Healing Your Golfer's Elbow? 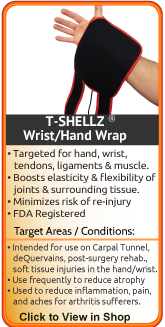 The best option we came across in our research to accomplish true healing of elbow injuries is the Elbow T•Shellz Wrap®. Use of this device results in a dramatic increase in blood flow to the injured tissues located deeper within the body - all in a non-invasive manner. The Elbow T•Shellz Wrap® is based on the scientifically validated principal of Electromagnetic energy as we discussed previously. This form of treatment is safe and effective as shown in numerous studies which can be referenced through the National Library of Medicine. Professional athletes and those in the medical field have been users of the technology for decades - it really hasn't been until recently that companies like ours introduced the treatment devices to the home user. Using the T-Shell Wrap is truly a unique experience. Within moments of applying a treatment to your injured elbow, you can feel the healing sensation due to the increase in blood flow deep within the area. During a treatment, and for quite some time after you finish, the treated area will feel relaxed and less painful. It's a very soothing sensation and extremely effective. 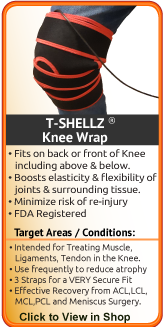 The Elbow T•Shellz Wrap® is an FDA Registered Medical Device and is suitable for use in therapeutic clinics and FROM HOME. It is completely safe for people and patients to use for themselves. Have you ever wondered by an athlete can return to activity after 3 or 4 weeks following a severe elbow injury - while your average person takes much longer to return back to normal? 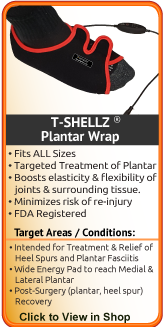 The secret isn't really that much of a secret - it involves consistent treatments (meaning multiple times a day) using a diathermy treatment like the T•Shellz Wrap® to stimulate blood flow to the injured tissues. Most athletes have the luxury of using in-house therapy facilities many times per day. How many us can afford the time and money to visit a therapy clinic multiple times a day? Very few indeed. 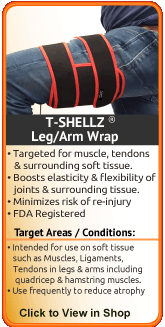 This is how you can gain the same advantage that athletes enjoy in healing their own injuries - by using a device like the Elbow T•Shellz Wrap® two or three times a day on a consistent basis. 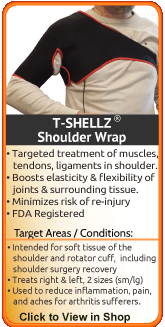 What Else Makes the Elbow T•Shellz Wrap® So Special? Can be used ANYWHERE on the Arm, Elbow or Upper Arm - very versatile! The most common question we receive from individuals prior to purchasing is - how many times a day should I be using my elbow wraps and when should I be using them? While treatment plans will differ for each individual and their specific injury, there are general guidelines that should be adhered to. Your body can heal itself and it's the blood in your body that makes it all happen. Your blood is how everything that's good inside of you is transported directly to your injured elbow tissue. Your blood carries oxygen, nutrients, water and antibodies right to the source of your injury and pain. Bringing proper blood flow to your injured elbow is essential for healing. 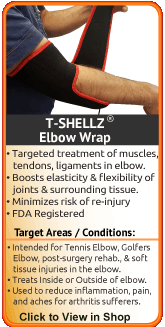 The only way to get Deep Tissue Therapy is through use of a Elbow T•Shellz Wrap®. Electromagnetic energy waves are not heat waves. 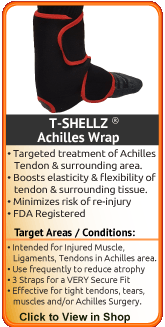 When emitted from the T•Shellz Wrap®, electromagnetic energy waves penetrate right through your skin and fat layers until they get to your damaged tissue. Once these energy waves reach your injured elbow tendon, they're absorbed and quickly converted into heat energy right at the location of your injury. The idea of electromagnetic energy waves is slowly catching on in North American, but the truth is, it's a technology that's been used for decades. Electromagnetic energy provides a wide range of health benefits for those not only suffering from a golfer's elbow, but for many other soft tissue injuries as well. 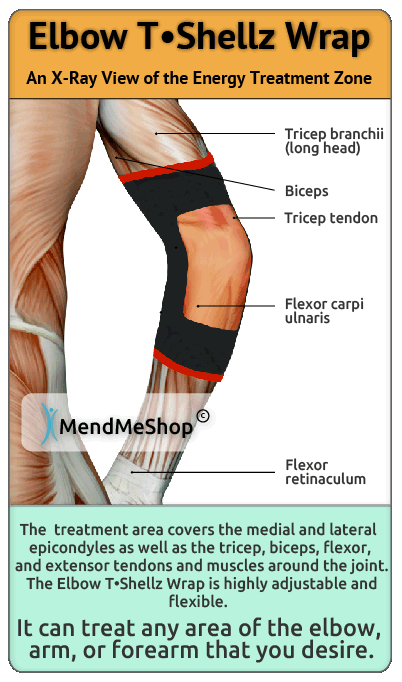 Your injured elbow will heal at an accelerated rate with reduced potential for re-injury. Your environment plays a huge part in the health of your body. Using tools that are properly fitted and weighted to your body and abilities will help you perform with success and avoid injury. Young athletes with improper training are among those suffering from Golfer's Elbow symptoms. When starting a new job, activity, or exercise routine, it is important to learn and understand the best techniques for you to achieve your tasks and goals. It is important for athletes to have their techniques and equipment checked by professionals for the best fit and performance. Why use movements or tools that don't give you the best opportunities for success? Just like athletes, workers with physical jobs or people performing repetitive tasks should refer to occupational therapists. These specialists understand how the body works and which movements should be avoided as they can lead to injury. Over extending your arm while painting can cause an injury just as easily as an improper back hand swing. It is important to understand that your body is a complex network of connected structures. When using the wrong muscles or positioning, you put yourself at risk for injury. Training your body to perform the ways you need it to will decrease risk of injury. An untrained body may make movements with the least amount of effort... BUT ...this can lead to awkward motions with badly distributed, stress causing, long term injury. It is important to remain physically active. The health of your whole body contributes to the health of the individual parts. Maintaining a healthy weight and overall level of fitness through regular activity and healthy eating will increase your ability to avoid injury. Lack of activity can cause muscles to become weak and unsupported. Without strong muscles your body places the stress on weaker structures like joints. Strong muscles help maintain a strong body, evenly distributing weight and forces to the areas that can handle it properly. Remember to drink fluids and rest. Resting your body will help reduce fatigue in your muscles. Energized muscles are strong and will help you complete tasks efficiently and effectively. If you want to avoid re-injury, or manage pain and increase circulation for lifelong health benefits, an Elbow T•Shellz Wrap® will provide the results you are looking for. To prove this, we offer a 60 day trial period on every T•Shellz Wrap®.